After years of being tabbed as one of Toronto’s “up and coming” neighbourhoods, Leslieville has arrived and is one of Toronto’s hippest places to dine, drink, shop and live. Leslieville’s roots are in light industry gradually evolving into a residential and commercial area, as artists, musicians and designers took advantage of affordable real estate prices. In some of the former industrial areas large film studios have opened, including Cinevillage and Showline Studios. Just to the south, in the Port Lands area, the massive new Pinewood Toronto Studios have been built. The original Leslieville housing stock was built along Queen Street and South to Eastern Avenue in the late 1800s. The architectural styles include Ontario Cottages, Second Empire Row Houses and Victorian homes. The next generation of Leslieville homes were constructed in the early 1900s, noth of Queen Street. This section of homes range from modest detached to semi-detached houses as well as a number of bungalows. Recently, there have been a number of contemporary designs-oriented homes appearing in the neighbourhood. 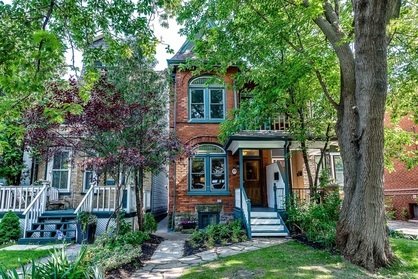 Thinking of moving to Leslieville? - From 1922-1955 there was a massive, weaterfront amusement park on the southwestern flank of Roncesvalles. The Sunnyside Amusement Park was demolished in 1955 to make way for the Gardner Expressway. Between 1831 and 1840, Colonel Walter O`Hara ( (a prominent and wealthy citizen who was a former, heavily-decorated, British soldier) bought 210 hectares located north of Queen from Roncesvalles Avenue to just east of Lansdowne Avenue. O`Hara, who was born in Ireland, built a comfortable home for his wife and eight children called West Lodge (named after his family`s Irish estate) just north of Queen Street and east of Lansdowne Ave.